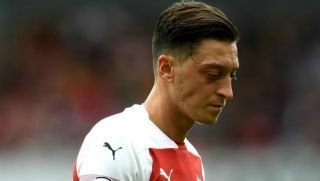 As is the way with social media, Arsenal playmaker Mesut Ozil couldn’t even post an innocent tweet without inviting some users to mock him. The German ace confirmed that he had set up a Twitch account as he steps up his gaming, as seen in the tweet below, and invited his fans to follow him on there. However, what he didn’t bargain for was for some eagle-eyed users to spot his status in the background, which was set as ‘invisible’, as seen in the tweets below from some of those who took a cheeky dig at him. As noted by The Mirror, it’s a criticism that has been levelled at him in the past in terms of his performances on the pitch, where he has had a habit of being less influential in big games and is ultimately anonymous or invisible. With that in mind, some have now suggested that his gaming habits are the reason behind that, while others have just had some fun with the irony involved in the whole thing.